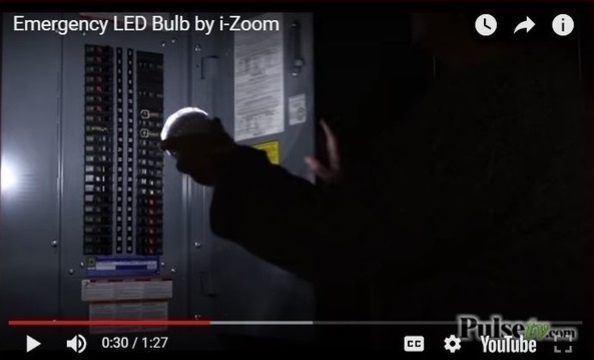 What If… a normal LED Light Bulb could automatically turn on when there was a power outage? What If… this same LED Light Bulb had a remote control that you could use to turn it on and off? What If… you could unscrew this same LED Light Bulb and use it as a Handheld Flashlight? This Innovative 3-in-1 Smart Bulb does ALL THREE! 5 Reasons Every Homeowner Needs This 3-in-1 LED Smart Bulb. POWER OUT, LIGHT ON! – The Smart Bulb has a rechargeable built in Lithium Ion Battery and will automatically activate in the event of a sudden power outage (Hurricane, Snowstorm, or Worse) providing light for up to 3.5 hours. DOUBLES AS A FLASHLIGHT – This innovative Smart Bulb doubles as a LED Flashlight! Simply hold the socket with your hand and the Smart Bulb will switch on as Super Bright Flashlight. PLUG AND PLAY – No tools needed! Simply screw the Smart Bulb into any standard socket and it’s intelligent design will illuminate automatically when it detects the loss of power. ENERGY EFFICIENT – Designed utilizing hyper-efficient LED technology, this Smart Bulb uses 90% less energy than traditional incandescents and has an estimated life-span of 25,000 hours! RECHARGEABLE – Use this Smart Bulb all day, every day as much as you want. It auto charges when lights on, stops charging when the battery is full. Don’t Wait! CLICK HERE to be one of only 500 buyers to receive 78% Off. *This offer is unpublished and only accessible through the above link.